Guys do you have any suggestions for tomorrow’s deals? Germany is a difficult situation. No matter how much I have asked GB to include Germany into the offers, they reply by saying that it’s not possible. More Xiaomi deals are here. There are even more coupons for lots of Xiaomi phones, so if you need a specific one just PM me. Unfortunately I don’t know the reason. I will try to ask them once Cyber Monday is over. Edit: Actually you could try to send GB’s representative a PM. You might be able to get your answer. You are always up for some casual trolling, aren’t you? All for a good spirit on this forum; at least that is my intention. Oh come on, how wouldn’t they be for a good reason. BLF is one of the friendliest forums I have come across. Does it have to be flashlights related?? If not, I have been asking for a good price on the following ceiling light for months. Good price means it needs to be <US$50! It doesn’t have to be a be a flashlight. I have made a request for both products. Hopefully I will get a deal at least on one of them. As requested, the new deals are also available for more European Countries! Haha, a flashlight a day makes the doctor away. Edit: will you keep it stock? Not painful, really witty I would say. Pain was from laughing too hard. I thought it was good one too. I hope soon you will see that sweet deal again… and dangit your country is not excluded this time… and yes the code has not expired yet!… And to see that stupid low price on your Paypal screen before hitting that “proceed” button. It’s going to be extra sweet for you! I would say yes, keeping it stock as my soldering skills are somewhat limited. Also there’s not much information in the forum on this light. It seems, diving is not so popular among flashaholics. So i don’t know how much modding is possible. I intend to use it underwater. Most important is that it’s really waterproof and working reliable, everything else comes after that. Oh if you are going to use it for diving just let the factory components on. No reason to fiddle around if your life depends on it. Guys I got sweet deals for some knives, batteries, chargers and a couple of powerbanks. Can you please restore the MT01 code? It says expired, and I tried it right after it was posted. Thanks. Hmm, it was not supposed to expire that fast. I will contact GB to see what they can do about it. I am keen on your price on the Cima 1 knife. I got 2 already, so I really don't need another one, especially as my Ganzo G8012 just came in and is that much better (in this case bigger is better ). For the rest, I am really up to a serious thrower but gotta keep costs down. For being new to this, my limit is 20€ for stuff that I don't really need. I'm not a flashaholic yet. @bilakos: maybe you can negotiate something similar to previous promo? 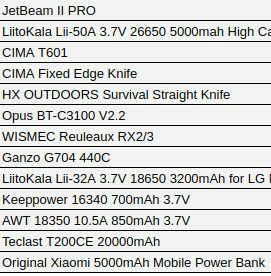 Damn… there was a promo for https://www.gearbest.com/power-banks/pp_798193.html – $19,99. I missed it. Found $22 one though @bilakos: maybe you can negotiate something similar to previous promo? I am keen on your price on the Cima 1 knife. I got 2 already, so I really don’t need another one, especially as my Ganzo G8012 just came in and is that much better (in this case bigger is better ). For the rest, I am really up to a serious thrower but gotta keep costs down. For being new to this, my limit is 20€ for stuff that I don’t really need. I’m not a flashaholic yet. Yea, I don’t know what happened. I don’t think it ever worked.